Of all the captivating mountains on the planet, the one so many of us strive to get close to is Mount Everest. Wrapped in ethereal wonder, fuelled by the storytelling of our youths, this mountain alone attracts the majority of Nepal’s trekking tourism, and more of us than ever are turning up to trek her foothills to spend just a few hours in her presence. The highest massif on earth, it seems, is much more than a mountain. 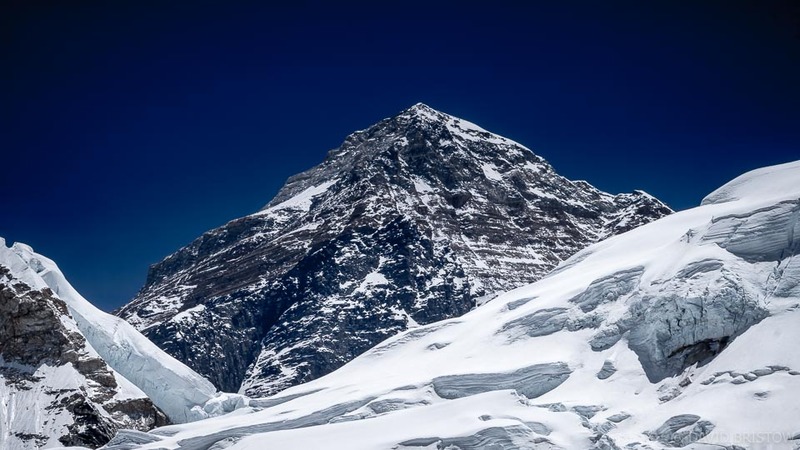 Everest throws a challenge of epic proportions and success on this mountain – called Chomolungma by Nepali Sherpas – can be worn like a badge of honour. In short, getting to Everest means something, even if, like us, your only goal is to reach its base. Even when you take away the mountain’s ‘top of the world’ status, what you are left with is one of the most staggeringly beautiful amphitheatres of peaks I’ve ever laid eyes upon: Everest standing in good company beside Lhotse, Nuptse, Pumori and Lobuche West. If Everest was smaller, just another Himalayan mountain, this incredible cirque of snow and rock and sculpted blue ice would continue to captivate me, as it has four times in my life already. Just to catch sight of that steely grey spear of rock at the top of the world is worth every rugged, oxygen-deprived step. 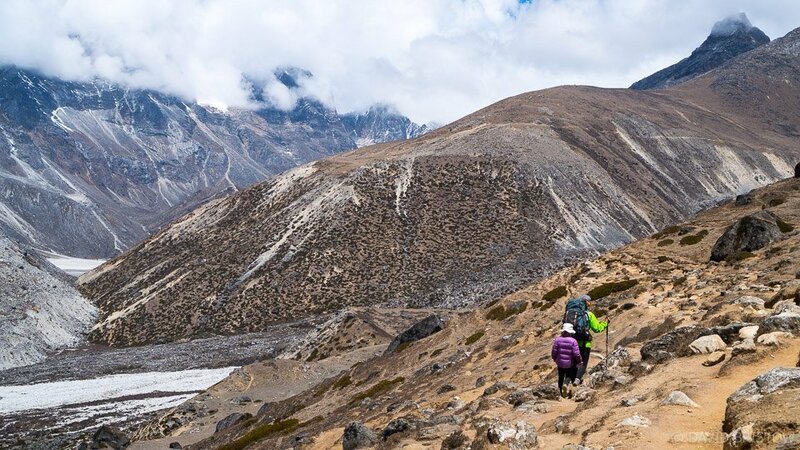 Yes, the trek to Everest is popular and crowded, yes, the lodges can be noisy and overpriced, but does this trek lead you to one of the most beautiful locations on earth? Undeniably yes. 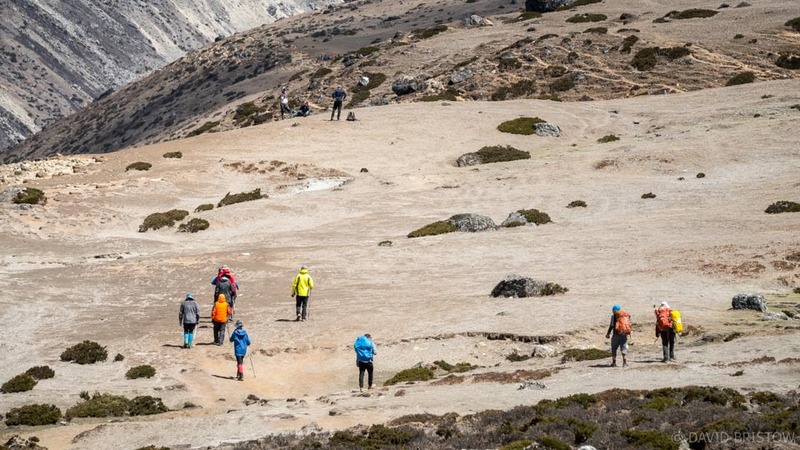 Planning an Everest trek can be as easy as booking a guided tour and starting hill training, but this trek is easy enough to plan and undertake by yourself, no guides or porters required. However you travel, the following guide should iron out any questions you have about what to expect on the trail. You read about our route and itinerary HERE. Getting There: Flight to Lukla or Jeep to Phaplu? 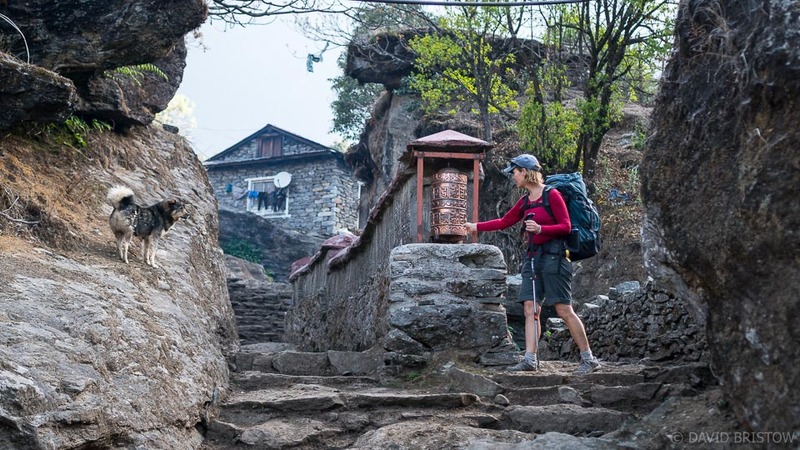 Most trekkers begin their treks with a flight from Kathmandu to Lukla (around US$170), then walk two days to Namche Bazaar where they spend two nights acclimatising to Namche’s 3440-metre altitude. 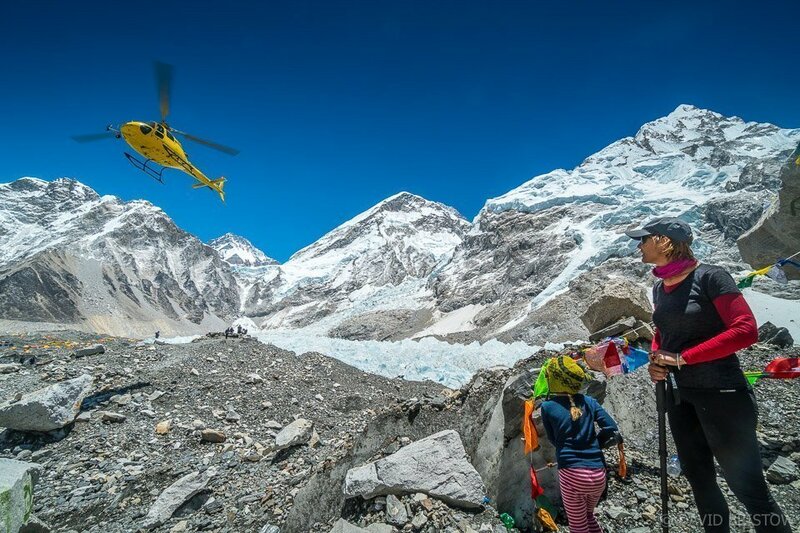 Flying saves time (if the weather is good and your plane actually gets airborne), but if you like the idea of saving money and value the benefit of getting fit before your body starts the arduous process of adjusting to great heights, consider taking a jeep or bus from Kathmandu to Phaplu and starting your trek from there (allow five days to reach Namche). Jeeps reach Phaplu in around eight to nine hours (with stops for breakfast and lunch) and cost 2000rp per seat (about AUD$25) but those 10 seats squeezed into three rows of a regular 4WD are incredibly tight! For extra room all around, you could book the two front seats or if there’s two or three of you, buy a row of four to give your buttocks some breathing space. We chartered our own jeep to give our family more room and the flexibility to call our own toilet stops. Conveniently, it picked us up from our hotel in Kathmandu at 5.30am (no rushing out to the Ring Road in the early hours) and our journey was leisurely, scenic and fun. October is the most popular month to trek to Everest, favoured for good weather and clear skies. The downside to a pre-winter trek is the crowds and the subsequent competition for beds (yes, trekkers really do bed down in the lodge dining rooms). The other popular time to trek is April-May, just after the worst of winter chills and before monsoon rains begin. At this time you can expect some moody skies but it’s less busy than October. From Lukla allow a minimum of eight days to reach Everest Base Camp and another 3-5 to return to the airport at Lukla. We added a night at Thukla on the way up to break the 600-metre rise in altitude between Dingboche and Lobuche that stops many trekkers in their tracks and can bring on AMS symptoms overnight. If you start your trek in Phaplu, bank on spending 17 or more days on the trail (plus two travel days on the bus or jeep). How much you spend depends firstly on whether you hire a local guide (around US$30 per day) and a porter (slightly less). Travelling independently and carrying our own packs gave us considerable freedom to move at our own pace and adjust our itinerary as we pleased, and saved us money too. In truth, if you can identify a trail and become familiar with the route, you don’t need a guide at all. Food prices rise considerably as you get closer to EBC: the dal bhat that costs 200 rupees in Kathmandu will set you back up to 950 rupees in Gorak Shep, ouch!! 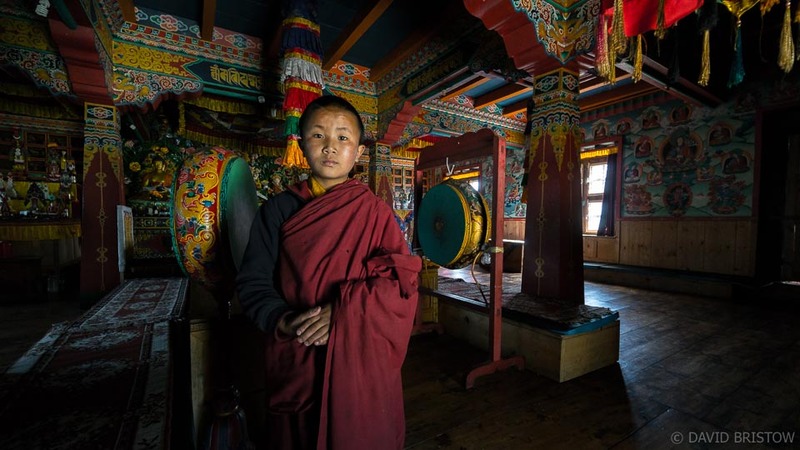 Our trio – two adults and a six-year-old – spent less than 2000 rupees per day south of Namche Bazaar, where rooms were offered for free when we ate our nightly meal in the lodge. By Gorak Shep that figure had doubled and we were only eating the most economical rice-and-noodle dishes on the menu and resisting the beer, soft drinks, overpriced chocolate bars and bakery brownies. We carried a decent stash of chocolate bars, dried fruit and nuts, yak cheese and crackers, cookies and more so that we could snack anytime on the trail, and topped these up at Namche before we trekked on. Phone charging and hot shower costs really stack up in the hills too. We only splurged on hot showers a couple of times, paying 300-400rp each. We avoided phone-charging fees because we were carrying laptops to download our images, which added to our heavy loads but enabled us to avoid the 1000rp charge in Gorak Shep to charge a battery! At lower altitudes, battery and phone charging ranged from 200-300 rp an hour, gradually rising the higher we climbed. Two unavoidable expenses are the Sagamartha National Park entry fee (3390 per person) and the local tax you’ll pay in Monjo or Lukla (2000rp per person), which replaces, in the Solu Khumbu at least, the TIMS card you’ll need in order to trek elsewhere in Nepal. After setting out from Phaplu we paid around 200-300rp per night – a token amount – for stays at Traksindu and Jubing, and then paid nothing for our beds at lodges in Surke, Khari, Benkar and Namche Bazaar (try the Pumouri Lodge in Namche where beds, phone and battery charging and wi-fi was offered to us for free). Above Namche, all the lodges we stayed in were free. I can recommend avoiding Tengboche unless you really want to see the monastery and pushing on 20 minutes down the hill to Debuche where you can pray with the local nuns instead. In Louche however, all lodges charge a mandatory 500rp per room. When you get to Lobuche, have a good look around because the standard of rooms we were offered for the price varied dramatically from almost-windowless boxes with mouldy pillows to the ensuite room we finally took. Families beware: we really had to scout around to find rooms with more than two skinny beds, a challenge when you have one or two young trekkers who want to share your room. Menus were fairly similar everywhere we stayed and packed with carbs: fried noodles and rice, soups, potatoes, dal bhat, Sherpa stew, chapatis, omelettes and usually pizza, pasta and maybe momos too. Many trekkers moan about the limited choices, but we didn’t mind and my six-year-old was happy enough with toast, omelettes, noodle soup and boiled eggs, and could have eaten pizza for weeks. It takes time to acclimatise to altitude, and no matter how slow the ascent, some trekkers never manage to reach base camp at all. All current advice recommends ascending no more than 300 metres a day above Namche Bazaar, and allowing two nights at Namche and again at neighbouring villages Pheriche/Dingboche a few days up the trail. 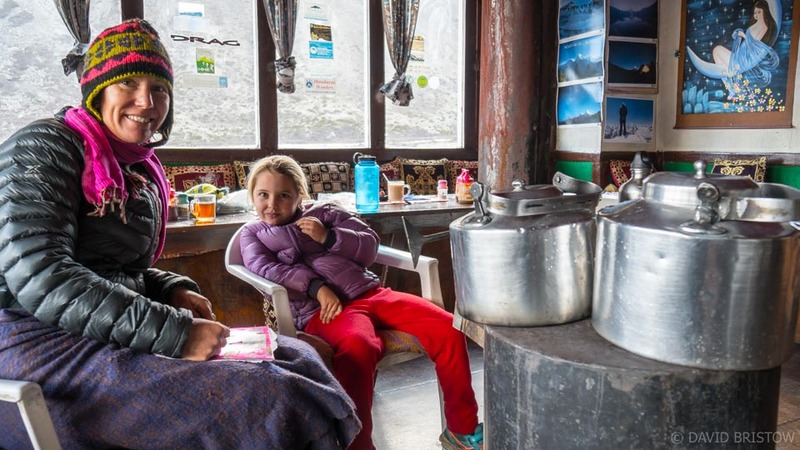 Very few trekkers stick to this advice though, routinely storming the almost 600m altitude climb from Dingboche to Lobuche, bypassing Thukla (Dugla) at the halfway point where two lodges provide well-priced meals, clean rooms and even a bakery. The reason most trekkers push on seems to be because the easy trek to Thukla takes only a couple of hours, and with plenty of fuel in their tanks and time in the day, it seems doable to continue on to Lobuche. 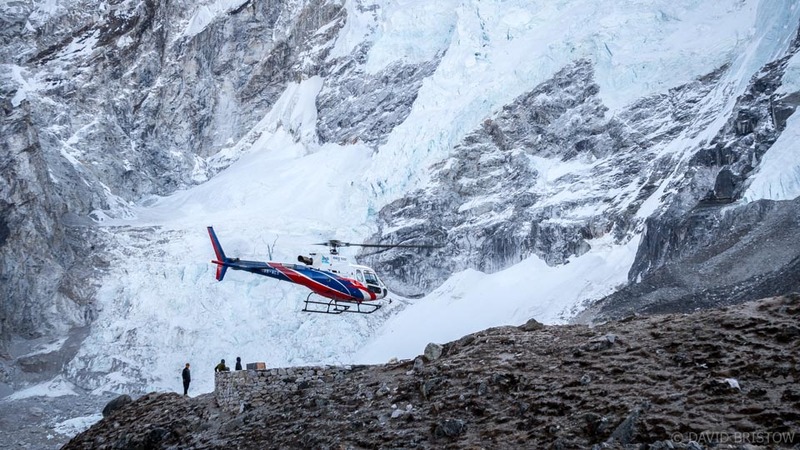 But that’s where a lot of treks end, and on ours, we watched one man stumble out of a chopper in Pheriche, oxygen mask on his face, after falling prey to AMS in Lobuche. 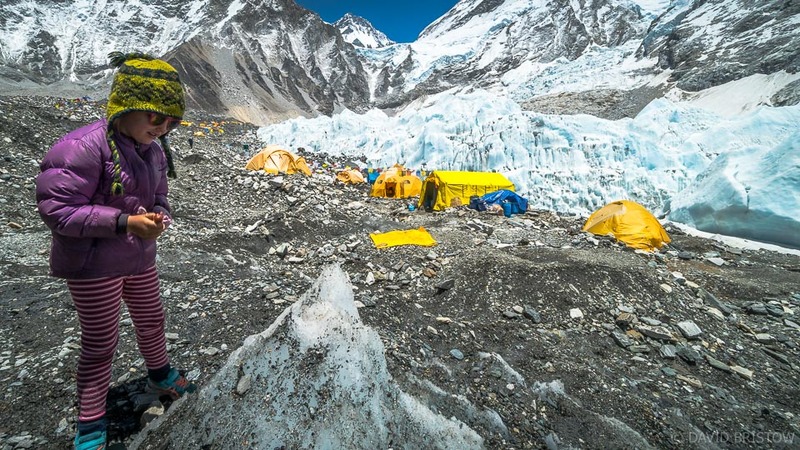 The week before, another trekker didn’t leave Lobuche alive. Above 2500 metres, where your body begins to feel the decrease in air pressure, there is less oxygen available in each breathe you take. 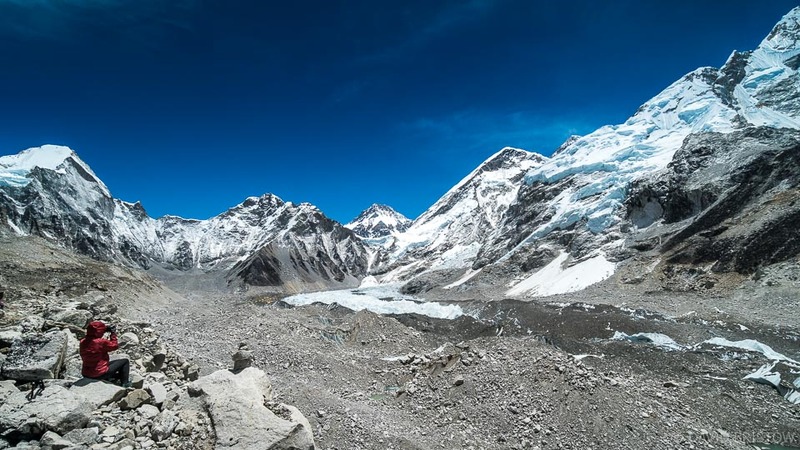 At Everest Base Camp the air you breathe contains half the available oxygen you would breathe at sea level, which is why it’s described as ‘thin’ air. 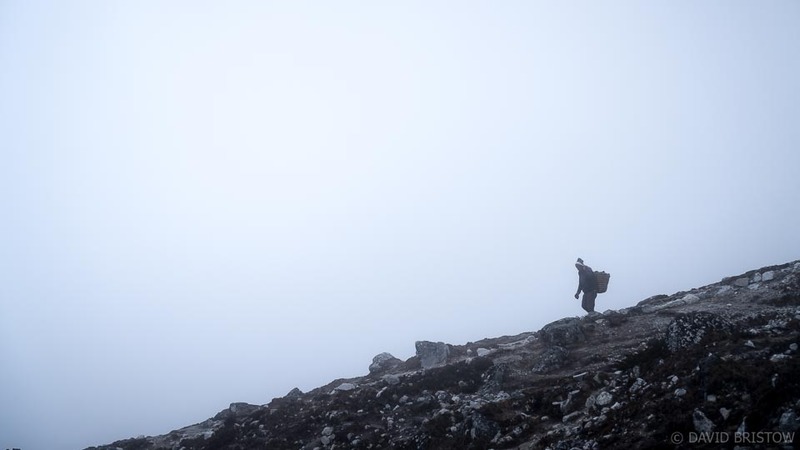 Most trekkers, given enough time, will acclimatise to small, gradual increases in altitude, but if you rush the process, mild symptoms of AMS – Acute Mountain Sickness – may well present themselves: a fuzzy head or headache, breathlessness while walking, fatigue, sleeplessness, dizziness, loss of appetite, irritability and/or nausea. Any of these symptoms should be a red flag to stop, rest and wait until they resolve themselves before climbing higher. If they do not go way or get worse, descend to the last altitude that you felt well at and take an acclimatisation day. Once you feel better you can then decide if you want to head back up the trail. 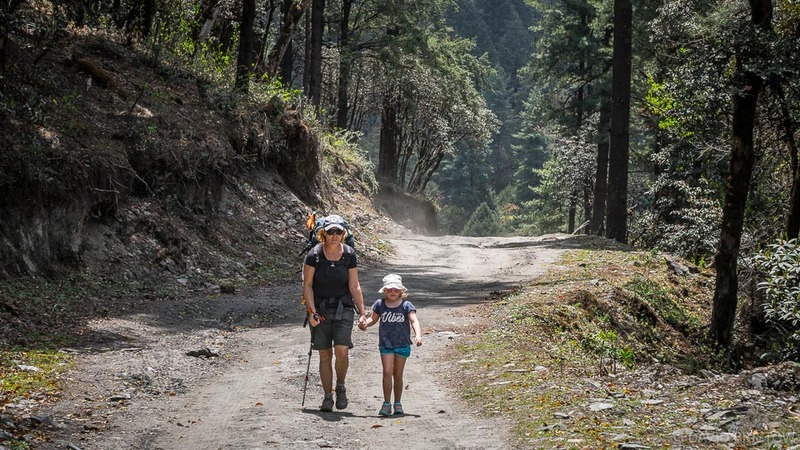 Shorter daily distances, a slow, easy pace and a good stash of kid-friendly snacks: that’s how we tackled this trek with our six-year-old daughter in May 2018. 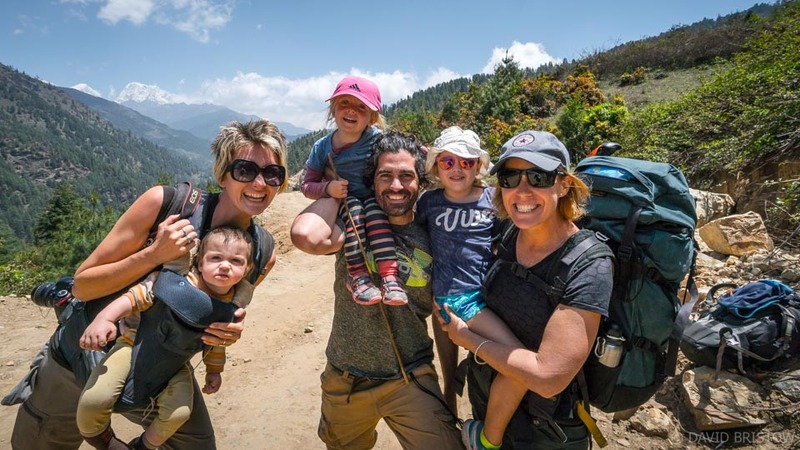 Really, it wasn’t very different from trekking before we became a family: Maya was well equipped with warm clothes, took the same time adjusting to altitude, and enjoyed our daily walks up the valley as much as we did. Apart from freeing her from the need to carry a backpack, she travelled like any other trekker (although she skipped a little more). Above Namche we watched Maya closely for any signs of fatigue or AMS, and were prepared to stop or descend if she started to falter. The good news is that Maya loved the trek and her body acclimatised well, without the use of Diamox. So many parents stopped to tell us that they should have brought their kids, but they didn’t realise how achievable that idea would be. If you have kids, I strongly recommend you consider this trek with them. The lodges and menus (and bakeries en route) are some of the best you’ll find in Nepal, and the landscapes are so diverse that scenery keeps surprising, all the way to the top. If you have kids, read more about Maya’s experience HERE…. Phone calls using our Nepali sim (Ncell) were possible on the trail, but accessing our data ceased to be a possibility above Namche. Most trekkers bought Wi-Fi cards at lodges en route to check emails and post photos. We considered the trek a digital holiday.